I know there are others of you out there who garden in raised beds, but everyone around me grows vegetables in long, single file rows. So why do those of us who use raised beds do so? 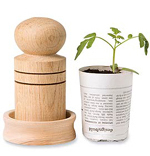 I have been gardening this way for over twenty years and blogging for almost five years but I have never written on GardenDesk about why I feel this is a superior way to grow vegetables. 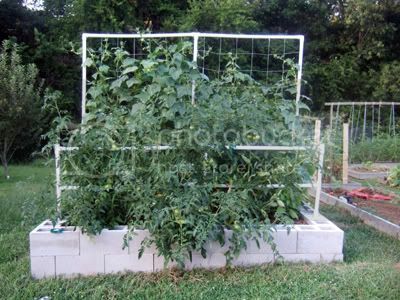 before going on a rant about the benefits of raised beds, I want to tell the story of how I arrived at raised bed, square foot organic gardening. 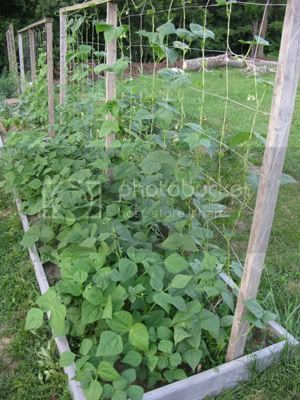 When I was a child, my mom had a garden with corn, beans and cabbage. She planted them in long rows like everyone else. One of my chores was to weed those rows. I found the hoe to be clumsy and I often chopped right through a young been or corn plant. The work was hot and monotonous. I vowed that when I grew up, I would never have a vegetable garden! My mom stopped raising a garden when I was in Junior High School (thank goodness) and gardening for me was all but forgotten. While I was in college my mom re-married and my new step-dad decided to have a garden. He chose to locate it in what used to be a large tobacco field that was tended for us by a neighboring farmer. Since the field was much bigger than he needed, and I would be spending the summer with him and my mom, he approached me about vegetable gardening with him. He also wanted to recognize that I was growing up, so instead of getting me to work on his garden he offered to let me have one half to tend on my own. I don't know why I even entertained the thought, but I agreed. I knew nothing about growing vegetables or even which vegetables would grow in our area. I went to the college library to research it and luckily I happened upon a book about organic gardening with French intensive techniques. 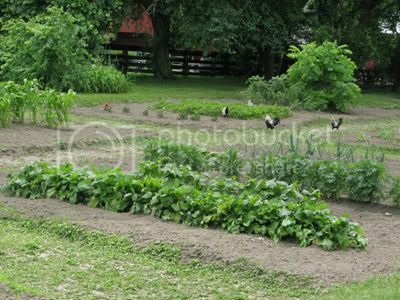 It was published by Rodale and outlined how to create raised beds with double-digging and mounding up soil from the paths. 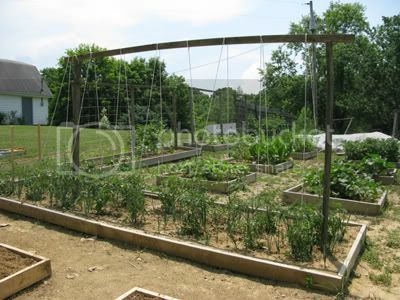 It described how to use block planting (what Mel Bartholomew calls Square Foot Gardening), trellises, companion planting, succession planting, using compost and other organic techniques. Wow - this book got me excited! Summer arrived and it was time to start the garden. My step-dad bought a new fancy tiller to prepare his plot. I used my youthful energy to dig a series of raised beds but only used half of my allotted space. 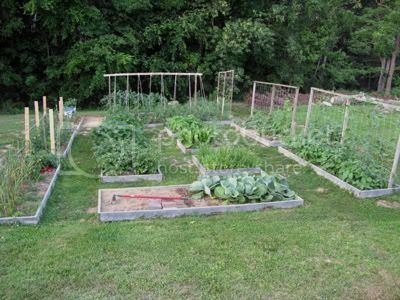 He planted long rows of many different veggies; I planted them in blocks. I got a job cutting grass with a landscape service and brought home bags of grass clippings and bags of straw. With these I set up a series of compost heaps and learned how to create finished compost every three weeks. He used chemical fertilizers and pesticides; I used compost. My step-dad weeded with his big tiller; I pulled weeds by hand until the plant leaves touched and shaded out the weeds. We had two major problems that both of us faced. The first one was rabbits! This location was far away from the house and rabbits began eating everything, especially the green beans. I'm not sure if my step-dad did anything to combat them, but I utilized a tip from my Rodale book. My girlfriend (who is now my wife) was a hairdresser at the time, so she collected all of the hair clippings that the beauty shop swept up. We brought home bags and bags of the hair and spread it all around and in my part of the garden. The human scent actually kept the rabbits away - especially since there were more veggies lined up in neat rows on the other end of the field without the human scent! My step-dad's beans were eaten by rabbits; my beans were eaten by us! The second big problem we both had was that there wasn't enough rain. He bought a fancy pump and hose system to pump water from the creek; I watered with had-carried buckets and jugs. He had the advantage here at first - until the serious drought hit. The creek completely dried up and so did much of his long rows of veggies. 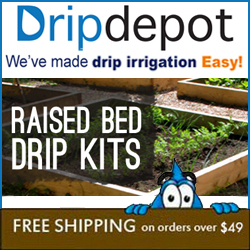 I carried milk jugs of water out and placed them in the middle of the beds as drip irrigation. I repeat this technique even today in my garden. I wrote a post about it with pictures, if you are interested. Now for the conclusion of my story. My step-dad's garden took up 3/4 of the field and I had the other 1/4 but my side yielded twice as much produce! Not everything I did that year was a success, but seeing the side-by-side comparison was amazing! I was hooked on gardening from then on. Too bad I was almost finished with college at this point. If I had just been starting, I seriously would have switched my major to horticulture. Now, I use untreated lumber for most of my raised beds and try to grow as much vertically as possible. I have even experimented with using cinder blocks and making the beds deeper. This post has become pretty lengthy and I still didn't adequately describe all of the benefits to gardening this way. Tell you what, I'll do that in a future post. I have some diagrams to show as well. So what about you? I'd love to hear from some of you. 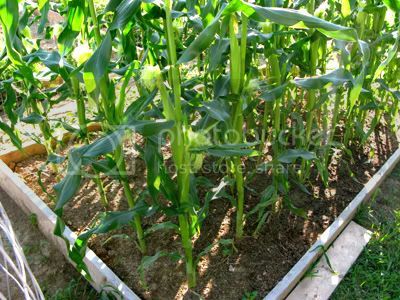 Do you grow vegetables in rows, in blocks or in raised beds? I'm not putting down any of the methods. 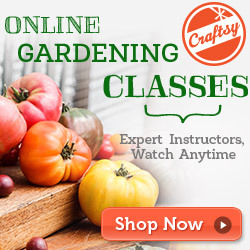 It is important to garden the way that works for you. Next time I will show you more what works for me, but what about you - what problems do you see with either method? What kind of success (or failure) have you had?